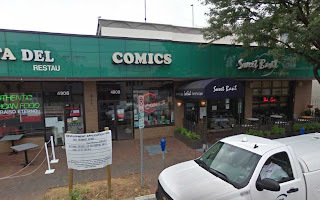 I was in the Baltimore/DC area for the past several days, and was able to take some time out to visit the Bethesda branch of Big Planet Comics. Just a little time, unfortunately, since we were rolling through there on Labor Day about 30-40 minutes before they closed. The inside of the store was almost surprisingly clean. I suppose I've spent too many years inside of dark and ugly comic shops that ones that are bright and clean and tidy still catch me off-guard. The shop itself was pretty long and narrow, so most of the stock was on bookshelves lining the outer walls. On the left were mainstream trade paperbacks and hardcovers with the checkout counter on the opposite wall. Under the counter and towards the front right corner were manga. All of that took up about two-thirds of the store. The last third was split down the middle with some bookshelves. On the right were pamphlet comics; I just did a quick scan, but it looked like only the newest releases. On the left were more trades and HCs of mostly non-mainstream works with callouts for several popular creators and some of said creators' mainstream work mixed in as well. There was a small island bookshelf towards the front of the store with some newer and popular trades. These were mostly displayed with a facing cover, as opposed to just the spines on most of the other bookshelves. There was also, at the end of that, three shortboxes with some Silver Age comics. A dozen or so Golden Age books were visible in the glass counter under the register. I was impressed with the presentment of the store. It looked like a well-run, modern library for the most part. Lots and lots of books, placed neatly on bookshelves, and little in the way of other distractions. No real gaudy superhero posters, or peg-loads of action figures, or rows and rows of longboxes. It struck me as what most consumers would be looking for in a comic book shop these days. But you know me; I'm not looking for what "most consumers" are looking for. I've never been keen on separating "mainstream" material from everything else. I get the thinking behind it, and it might be the best approach for this type of business, but me? I'd rather just see everything listed alphabetically with no real distinction between publishers. My bookshelf downstairs has Maus right after Marvel Visionaries: Stan Lee and right before The Middleman. That's me. I don't see any need/reason to break them up. But I don't sell comics either, so I understand that might not work as well from a business perspective. Big Planet is a good store, and I definitely wouldn't mind shopping there regularly if I lived in the area. I picked up Amulet Book 3, Grandville and Water Baby while the S.O. got the first two Aya books. It's not quite the way I'd choose to organize a store, but then again I don't get the Dewey Decimal System either.